Compact IC-7700 Mini-Manual. 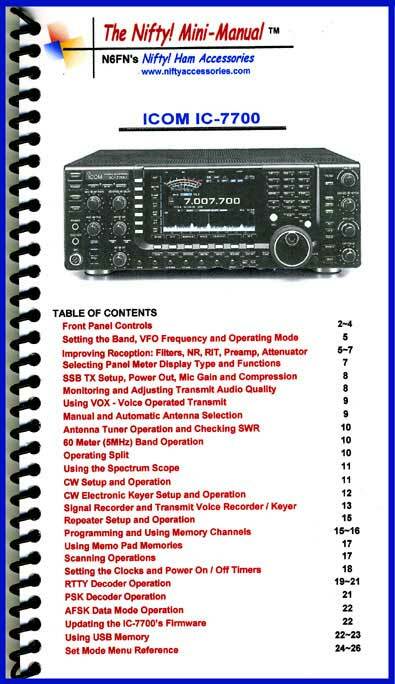 Comprehensive operating guide for the IC-7700. Size, 4.5x8 inches. Twenty-six high-quality laminated pages, loaded with detailed instructions. Ideal for setting-up and operating this feature packed rig. Instructions for using all menus and modes of operation. Includes changes for the Ver 2.00 firmware upgrade.